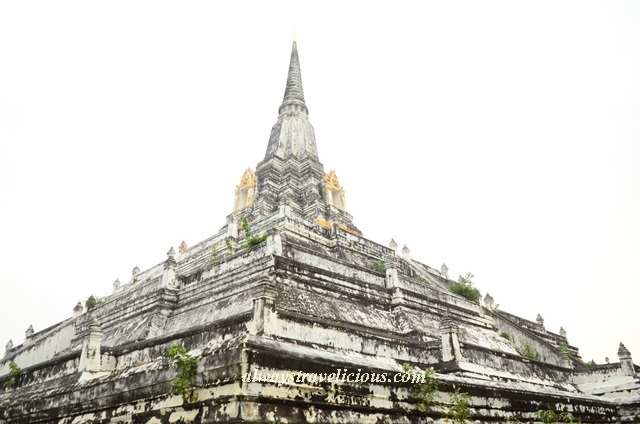 Wat Phu Khao Thong @ Ayutthaya, Thailand - Always Travelicious ! The most prominent feature of Wat Phu Khao Thong, or Temple of Golden Mountain, is the marvelous square-based stupa. The temple is thought to be established by King Ramesuan in 1387, built to commemorate victory over the Burmese army. The temple grounds also consist of an active monastery in the vicinity. In front of the stupa, there is a small altar with many rooster figurines on it – I am not quite sure if the roosters are a subject of worship but it was an interesting sight. Wat Phu Khao Thong was the last ruin that I visited on my day trip from Bangkok to Ayutthaya so unfortunately I didn’t get to explore this one too much. It would have been nice to climb the stairs and see the view. Getting there : Ayutthaya can be easily visited as a day trip from Bangkok. You can take the sky train to the Victory Monument Station’ he mini vans station is just across from Victory Monument Station. The mini buses leave once they get filled up. Rate is about 120 Baht per person. Journey is 1.5 Hours.